ONE family from 1 out of every 3 churches. That is NOT very many at all, you guys. And just think. 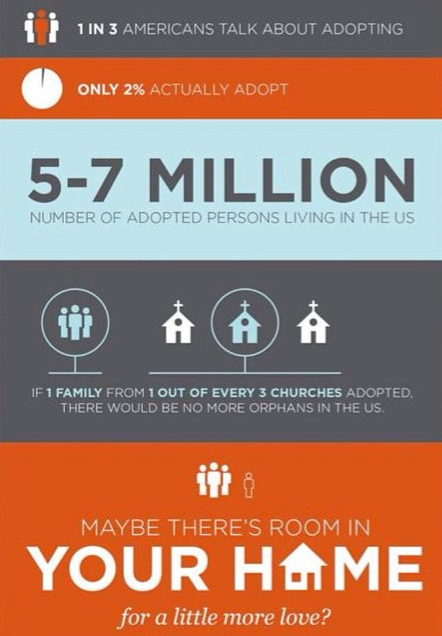 What if each of those 3 churches came together to finance those adoptions? Depending on the size of the congregation that would probably be less than $100 from each attending family. Not every person is called to adopt, but every Christian is called to care for orphans. James 1:27 "Religion that God accepts as pure and without fault is this: caring for orphans and widows who need help, and keeping yourself free from the world's evil influence" Notice it doesn't say "adopting orphans" but "caring for orphans". One way you can care for them is by supporting those families who are being called by God to adopt them. We have been really blessed by a few people throughout this process so far thanking us for allowing them to help. I am so blown away by that! Who thanks you for allowing them to give you money?! Kind, generous, God loving people, that's who. We have run into some naysayers and people who disagree with it, but for the most part, people have the general attitude of wanting to help. I think one reason it has been so hard for us is because we know there are so many needs out there. There are crowd funding pages shared all over Facebook every day, asking for money for everything from vacations to medical expenses. There are a lot of people who need help and a lot of people asking for money. Why should someone give money to our cause?! I don't have an answer for that except that children belong in families and we are just a family trying to following God's calling. The other biggest reason why fundraising is hard is because of pride. I don't know about you, but I don't want to have to ask people for money. Yes, it is going to a great cause and ONLY to that cause but I still would love it if that money was just dropped in our lap, or I woke up one day with $40,000 extra dollars in our bank account (ok, who wouldn't want that?). It is hard to humble ourselves and ask. It is hard to step back and let God work. Aside from cutting our expenses where we can, making extra money where we can (garage sales, selling stuff on Craigslist, donating plasma, etc. ), and things like that, we are trusting in God to provide it through people, grants, and more. I've seen it time and time again-the amazing story of His provision. I recently read something in terms of adoption funding that said "If God wills it, He will fund it." It is really hard to have that mindset when you are at risk of getting into a seriously sticky financial situation, but we trust that is true. So maybe the question still on your mind is why do families need to fundraise? The answer is that adoption is insanely expensive. Yes, you can adopt very inexpensively or even at no cost from foster care, but for various reasons that is not the right path for everyone to take. The cheapest I have seen a domestic adoption through an agency or lawyer is $14,000 (very rare), and the most expensive I have seen is $48,000 NOT including travel, post placement, home study and finalization expenses. Not very many people have $30-40,000 laying around. (You can read my breakdown of adoption expenses here.) Therefore, it is sometimes necessary to ask other people to step in and help a child gain a family. 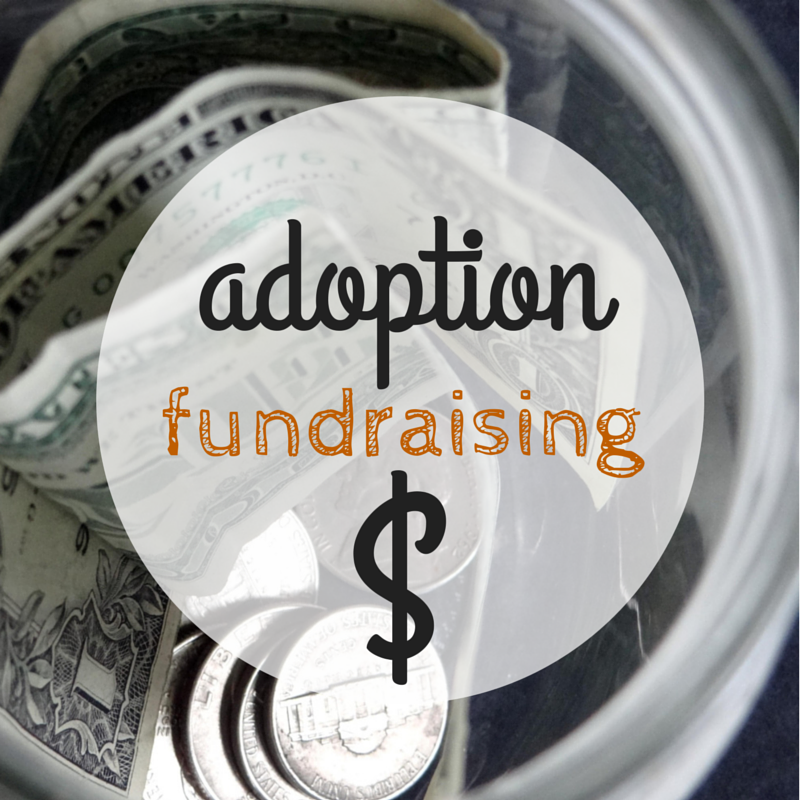 I feel like for us, adoption fundraising is one of those hard but so good areas where God grows and stretches us and we learn so much from it. He is in control of it all and we have to have faith that it will all work out according to His plan. But isn't that really how all of adoption goes?